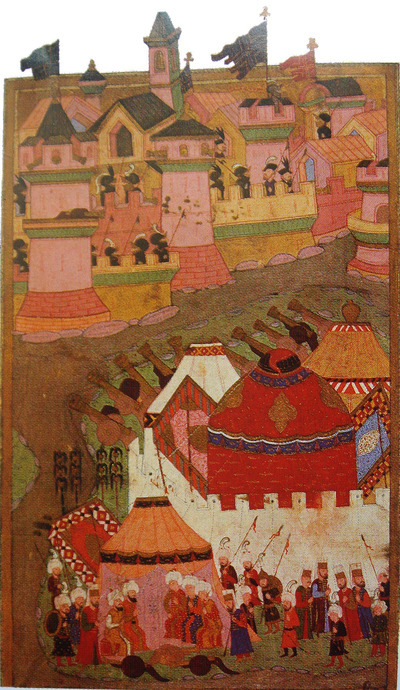 The 1529 Siege of Vienna, in an Ottoman depiction. Noel Malcolm, senior research fellow at All Souls College Oxford, is a polyglot and polymath. Skillful with sources in Albanian, Romanian, Serbian, modern Turkish, Italian, and other languages, he is probably best known for books produced during the Balkan wars of the 1990s, Bosnia: A Short History (1994) and Kosovo: A Short History (1999). He has published definitive editions of the writings of Thomas Hobbes and was knighted in 2014. His latest—Agents of Empire—a highly engaging (if complex) work began in obscure circumstances and deals with arcane matters. Still, Malcolm is gifted in moving from the microcosm to the macrocosm, and his survey of competing European and Eurasian dominions more than four centuries ago offers many useful insights for the present. This study originated with Malcolm's discovery, two decades ago, of a reference in a 16th-century Italian volume on the Ottomans. A passage noted that a treatise on Albania, then the main Ottoman province in Europe, had been written by a certain Antonio Bruni, described as Albanian himself. Malcolm saw this with excitement as probably the first such work by an identified Albanian. Malcolm dedicated an extensive investigation to Bruni, his cousins, a family named Bruti, and the environment in which they lived and served various masters. The "empire" in the title is somewhat general insofar as the narrative covers several realms: These include the Ottomans, the Habsburgs (Spain and Austria), France, and Russia, along with the significant roles played by the papacy, the Knights of Malta, and the city-state of Venice, with possessions along the eastern Adriatic coast, including (most importantly) Dubrovnik, plus Romania and Poland. Much of the geopolitical developments were played out against the background of the Ottoman subjection of a great part of Hungary, beginning in the mid-1520s. Religious communities involved in this broad tapestry of events include Roman Catholics, Orthodox Christians, Protestants, Jews, Sunni Muslims, and, in Persia, Shia Muslims. Rivalries between sects were as prominent as those between states. 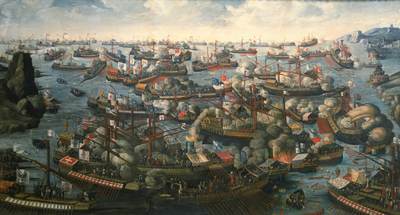 The main action takes place roughly between the failed Ottoman siege of Vienna (1529) and the Battle of Lepanto (1571), in which the Ottomans were defeated. The Brunis and Brutis were Albanians from towns that today are in Montenegro and little known to modern foreigners, but which sit on the frontier between the Albanian and the Slavic cultural spheres. During the time Malcolm describes, they were Ottoman possessions. Antonio Bruni was born in the mid-1550s, Malcolm surmises, and was educated by the Jesuits. His uncle Antonio Bruti, born in 1518 in the Ottoman-occupied Albanian port of Lezha, began as a trader but felt compelled to move from Lezha under Ottoman pressure. Commerce drove the struggle for influence in the Mediterranean no less than religious differences and reasons of state, and a good portion of the trade Malcolm describes was piracy, conducted from the Albanian harbors and often comprising the capture and ransom of shipping. While Christendom and the Ottomans were at odds over the greater issues of religion, Christian rulers allied with Istanbul against competitors within their own faith. France, in particular, under Francis I, was concerned to limit the reach of the Habsburgs and had no compunctions about aligning with the Ottomans to do so. The sultans gained partners, at one time or another, among the Poles (against the Habsburgs and Russians) and with Venice. Spain still harbored a captive Muslim population and was a more serious foe of the Ottomans. The papacy, then a leading power, attempted assiduously to unite Roman Catholics, Orthodox, and Protestants in a "holy league" that would repel the apparently easy advance of the Ottomans into Europe. The best-known such effort, the Council of Trent, met in the Italian city of Trento from 1545 to 1563. As described by Malcolm, the expectations of the Roman pontiffs in summoning the European Christian rulers to Trento were naïve: The Russian tsar Ivan the Terrible was invited if he would swear fealty to Catholicism, which was out of the question. Similarly, Protestant representatives were present at the council but denied substantial participation, although the council was called to respond to both the Ottoman conquests and Protestant demands for reform. Still, the popes were nothing if not eager in searching for collaborators. As Malcolm notes, in 1562, Pius IV sent an agent to the shah of Persia, who was at war with the Ottomans, soliciting his participation in a unified anti-Ottoman campaign. Through a daunting labyrinth of intrigues, the Albanian Brunis and Brutis made their way—including as combatants in the Battle of Lepanto, where the Ottoman fleet was defeated by the holy league mainly composed of Spain, Venice, and the papal states. In the seaborne combat, one member of the Bruni family, Giovanni, the Catholic archbishop of Bar, was an Ottoman hostage; on the other side, his brother Gasparo Bruni was captain of the papal flagship. Malcolm speculates that during the battle, the two brothers were no more than a hundred yards distant from one another. But Archbishop Bruni was murdered by Christian fighters who swarmed aboard the Ottoman ships and plundered the lives and possessions of Christian galley slaves. Malcolm is superb in his description of Lepanto, which most historians treat as the culmination of Ottoman strength. The encounter took place October 7, 1571, in the Gulf of Patras, off the west coast of Greece, but is named for the port from which the Ottoman fleet sailed. In addition to the diplomatic scheming and jealousy over command of the Spanish, Venetian, and papal fleets that led to it, Malcolm has assembled a thorough accounting of its maritime details. Some 40,000 Christian and Ottoman soldiers participated in the clash. Both the Christian and Ottoman fleets were manned by numerous fighters armed with muskets and the lighter arquebuses, crossbows, and conventional bows. Malcolm points out that the military technology that produced firearms had not replaced the bow, which "had a much faster rate of fire . . . and [was] unaffected by rain." To their disadvantage, however, the Ottoman forces depended on the composite bow, which couldn't pierce armor. According to Malcolm, the aim of the opposing naval forces was not to sink each other's ships but to serve as floating platforms for soldiers armed for hand-to-hand fighting. The point was to kill enemy personnel, raining shot and "Greek fire" (burning pitch) on their adversaries until they could board the ships and draw sufficient blood to prevail. The holy league won, but Malcolm dissents from those who argue that the Battle of Lepanto achieved anything permanent for the West: The Ottoman fleet was reconstructed rapidly, and soon Venice had entered into a humiliating peace with Istanbul. Malcolm also argues against the notion that Ottoman intentions in the 16th century were compelled by religious motives. Rather, Ottoman strategy was determined by a desire for security in the eastern Mediterranean more than expansion, and Ottoman hostility to Persia counted for more, in the 16th century, than aggression against Christendom. Of the many rewards of Malcolm's massive contribution, his description of life at the seat of Ottoman authority in Istanbul is by no means the least. Spies and influential people of doubtful loyalties abounded in Renaissance Europe, both in Christian and Ottoman territories. The sultans maintained Christian rulers in place in conquered regions, such as their Romanian possessions. Christian captives converted to Islam and assumed prominent positions in the sultan's state. 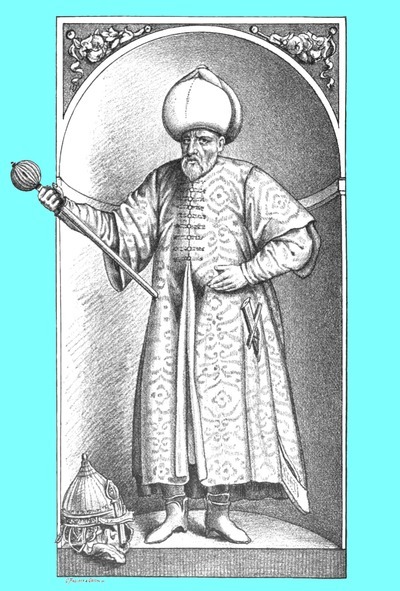 Malcolm gives much attention to a Serb-turned-Muslim, Mehmed Sokollu (original name Sokolović), who served as grand vizier; he also discusses the crucial activities of Sokollu's adviser—and medical doctor to Sultan Selim II—the Jewish Solomon Nathan Ashkenazi. Christians-turned-Muslims, Christian tributaries of the Ottomans, and Jews like Ashkenazi maintained communications between the Ottomans and the Western empires and city-states. Malcolm praises the Albanians, like the Bruni and Bruti families, for their physical courage, their martial endeavors, their frequent rebellions against their Ottoman rulers, and their personal loyalty. At the time of which he writes, Albania was a strategic asset, since it lies directly on the sea route between Istanbul and Venice. And what of Antonio Bruni and his manuscript on the Albanians? Malcolm located the text in two Latin copies, one in the Vatican library and the other at a library in Venice. Only 4,000 words long, it describes the Ottoman-controlled territories in the Balkans, their religious and linguistic differences, and the possibility of defeating the Ottomans by mobilizing them. From this discovery, Noel Malcolm has produced a demanding but necessary and relevant work that will be read and reread for a long time to come.